I’m sure that most of you reading this have a bookshelf at home with books that have been sitting there not touched for over a year. Instead of keeping them cooped up in your house, set them free so that others can read and share the same wonders that you found in the books. Leave it on a park bench, a coffee shop, at a hotel on vacation. Share it with a friend or tuck it onto a bookshelf at the gym — anywhere it might find a new reader! What happens next is up to fate, and we never know where our books might travel. Track the book’s journey around the world as it is passed on from person to person. When someone finds the book, they can enter in the Book Crossing ID to learn about the history of where the book has been and add to it if they wish. 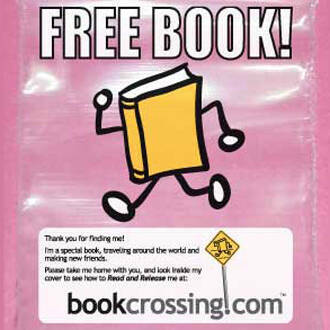 Book Crossings currently has over 700,000 members and over 5 million books registered. There have been so many times when I have been in a situation where I was stuck trying to figure out the correct thing for me to do when I have picked up a book and it has helped to crystalize the points that had previously all been a jumble. No matter what the book, when you read one you almost always take something new and positive away from it. 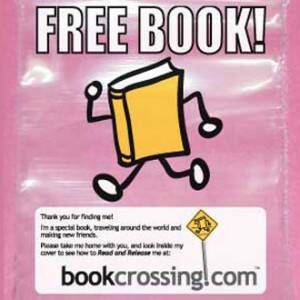 When you have a few minutes of free time, choose at least one book from your bookshelf, register it at Book Crossings and then set it free to the world. After choosing, let us know what book(s) you chose, if there was any particular reason that you chose that book and where you plan to leave it — then you can also comment here as the book makes its way from person to person. Of course, ever comment also adds 10 cents to help fund another microloan. I’ve been bookcrossing for two years now. Mind you, not in vast quantities, but when I have a book that I feel needs to be out there, getting read by a lot of people, I will set it free. I’ve always believed that a beloved book is better off being lost for all the people who have passed it on to each other than collecting dust on a shelf as a trophy of a nice read. This is a great idea and sounds like fun. I love to read and usually donate my books to a charity but I will try this too. COOL IDEA!!! Reminds me of the Smile Boston Project (http://www.bataclan.com/) where this painter leaves super cute paintings in public places and attaches a note that says that the viewer can take the painting for FREE … if he or she promises to smile at strangers more often!! I’ve never heard of this so thanks for bringing it to my attention. Now I’m off to the bookshelf to get started! Ooh I have a million books i want to unload. Thanks for the tip. Your topic Give the Wonder of Your Favorite Books was interesting when I found it on Monday. I’ve heard of it but haven’t signed up at all. I probably have at least one book that I could set free. I just did a search for “Prince Ombra” ( one of my favorite books ) and there are 37 copies listed there. Interesting, as not many people I’ve met have heard of it. I love books and was thinking about just leaving them places as a random act of kindness. Not just any book, mind you. Books that inspired me, like “Tuesdays with Morrie”. I believe that whomever is meant to find it will. It may help someone more than you think and the best acts of kindness are those done anonymously. There are currently two people in my office on Free Rice, BTW and I think we’re all hooked! I’ve been bookcrossing for a few years now. It’s fun, but I would advise folks not to get their hopes up that a book will immediately attract plenty of journal entries. Some will, some never will. It just depends. This is an awesome idea, I can’t wait to try it out!